Hello and welcome to my crafty blogg. my post today is for the new challenge starting over at Crafts Galore and the theme is 'Copy This'. each DT member has to create project for the entrants to copy for the challenge. And we've got some great inspiration here. 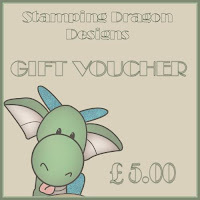 Our sponsor for this challenge is Stamping Dragon and the lucky winner of the challenge will receive a voucher to spend in the SDD on-line store. Prize: £5 voucher to the store. From the great selection of digital stamps at Stamping Dragon, I chose Jiggy the little dragon with a slice of lucious cake. I had in mind to use a backing paper I'd bought from Printable Heaven where the word 'chocolate' was the main theme. I am in the middle of relocating and my crafting stash is in storage, so I have been resisting the need to go out and buy new stuff until I am finally installed in my new craft space. The 'New Home' thingy has gone on too long and I have had no choice but to go craft stuff shopping. First thing I bought was some new Copics ( how can I resist) and some paper that is Copics friendly and some new cardstock. The digital image was printed directly onto the special paper and I used a selection of Copics to colour the dragon and cake. I'll add the list of markers at the bottem of the post. I found the quote on Pinterest and I thought is suited my card idea very well. The speech bubble was created in Photoshop and resized to fit the front of a standard A5 card. 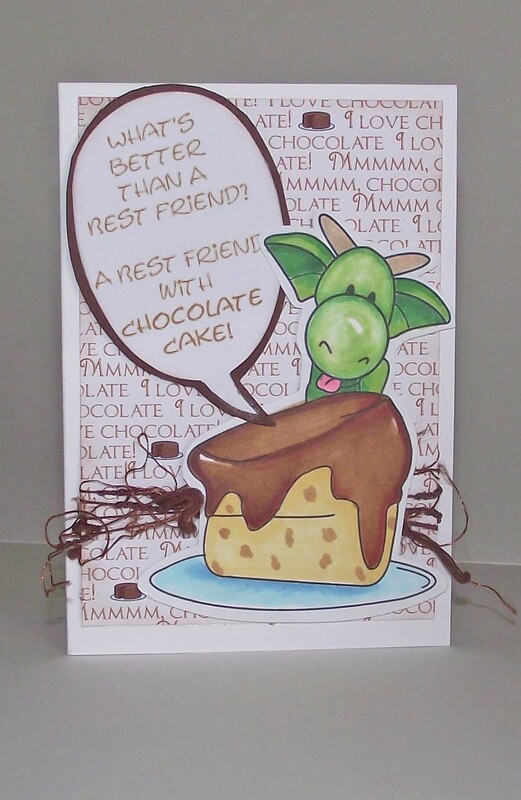 The 'chocolate' backing paper was cut to fit the card front just leaving a small border and the coloured image was mounted onto the card with dimensional tape with a few strand of dark brown fibers to create some texture. I made a backing for the speech bubble from some dark brown card to help pop it out from the background. To complete the card, this was also adhered to the card front using dinensional tape. And there you have it. I seem to be back in the card making business regardless of my lack of supplies :-) But it did feel good to be able to complete the card using with resources I have. The challenge runs until the end of July and you can check out the other DT projects for inspiration over at the Crafts Galore Challenge Blog. Looking forward to seeing your entries. Thanks for stopping by to visit and read my blog. Your time and comments are appreciated.